WASHINGTON (CNS) — A “Season of Healing” for sexual abuse survivors began in the Archdiocese of Washington with a Sept. 14 Mass at the Cathedral of St. Matthew the Apostle. He said those words helped him to realize: “How could it have been my fault? I was a child of 13 and deeply confused by the actions of this priest” who had abused him. In his homily, Cardinal Wuerl said the church’s priority in confronting the abuse crisis should be on “those who bear the scars of abuse.” He said the “candle of hope” lit during the Mass was symbolic of the time of healing, repentance, solidarity and recognition of dependence on God’s grace. During the Mass, he said the time of healing has started across the archdiocese, with priests, parishes, prayer groups and church organizations praying for God’s mercy. “Our shame, my apologies, the prayers of all of us, are for a purification of the church, a purification of all who are caught up in this pain and sorrow,” he said. 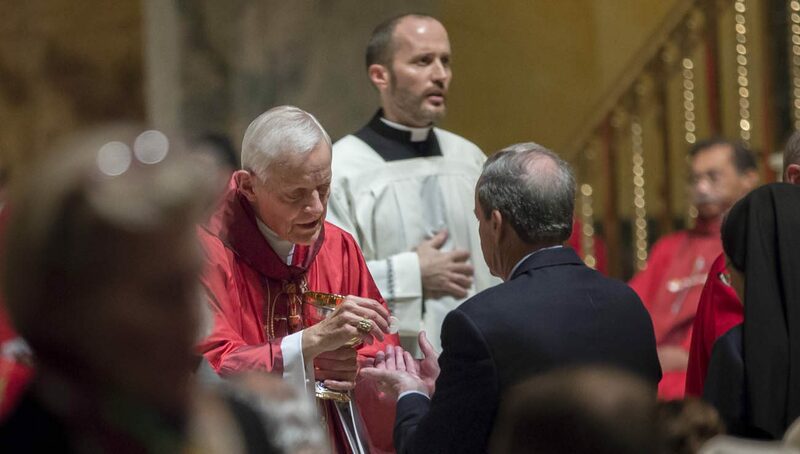 Days before the Mass, Cardinal Wuerl wrote to priests of the archdiocese, telling them he would meet with Pope Francis and ask him to accept the resignation he presented after turning 75 nearly three years ago. The cardinal said he was doing this “so that this archdiocesan church we all love can move forward” and can experience “a new beginning.” The cardinal’s Sept. 11 letter was shared so that the Mass for healing would not be overshadowed by questions about his status. In June, Catholics in the Archdiocese of Washington learned that their retired archbishop, then-Cardinal Theodore McCarrick, had been credibly accused of abusing a minor 50 years earlier while he was a priest in New York, and that he had been accused of sexual misconduct with seminarians while he was a bishop in New Jersey. Archbishop McCarrick’s resignation from the College of Cardinals was accepted by Pope Francis, who said that prelate could not serve as a priest in public and should live a life of prayer and penance. “Out of a righteous anger, we can all pray for that healing reflected in a commitment, resolve and manifest actions rather than just words on the part of church leadership to move in a much more transparent and accountable way, engaging laywomen and laymen alongside pastors and bishops, to begin the healing,” he said. Near the end of Mass, the cardinal specifically addressed the seminarians, reminding them they had seen the face of a survivor. “Everyone who has suffered abuse has a face, and is a person,” he said, stressing that their healing has to be a priority. “What we celebrate tonight is the power of the cross, the power of grace, the redemptive power of Christ’s love,” Cardinal Wuerl said. As he processed down the cathedral’s main aisle, the cardinal invited Nugent to walk beside him and they greeted people together after the Mass. He also said Cardinal Wuerl “has been a true leader” in the archdiocese’s efforts to help survivors of any kind of sexual abuse.